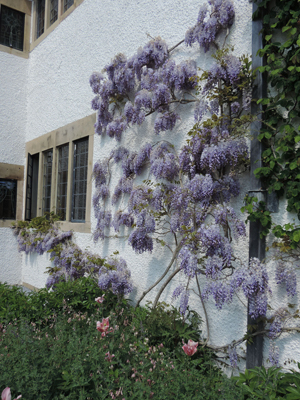 Sandy Felton visits Cumbria’s iconic Blackwell to meet the gardeners and enjoy this amazing Arts & Crafts house, its delightful garden and unparalleled views. Take one beautiful house – designed in 1898 by Mackay Hugh Baillie Scott (1865-1945) and completed in 1901 – plus one certain garden designer – Thomas Mawson – and set it in the outstanding scenery of the Lake District and you have Blackwell, one of the most important surviving Arts & Crafts buildings in the country. Built for Manchester brewer Sir Edward Holt as a holiday home, Blackwell and its surrounding garden, is perched on a hillside overlooking Lake Windermere, giving the visitor a panoramic view across the Lake and the surrounding fells and mountains. 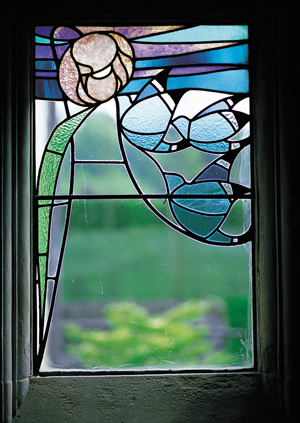 The Lake District is reinforced inside the house by the decorative detail in many of the rooms and windows where you find the mountain ash and the rowan tree, wildflowers, berries and birds carved in windows, friezes and woodwork. In the 90 years since the Holt family left, the house had various occupants as tenants – significant in that no major alterations took place – before becoming a girl’s school during the Second World War for pupils evacuated from Huyton College, Liverpool. When the school closed Blackwell was bought by a businessman who leased it as offices but by 1997 the future of Blackwell looked uncertain. It was then that Lakeland Arts stepped in and approached the owner, even though the house at that time was not up for sale. 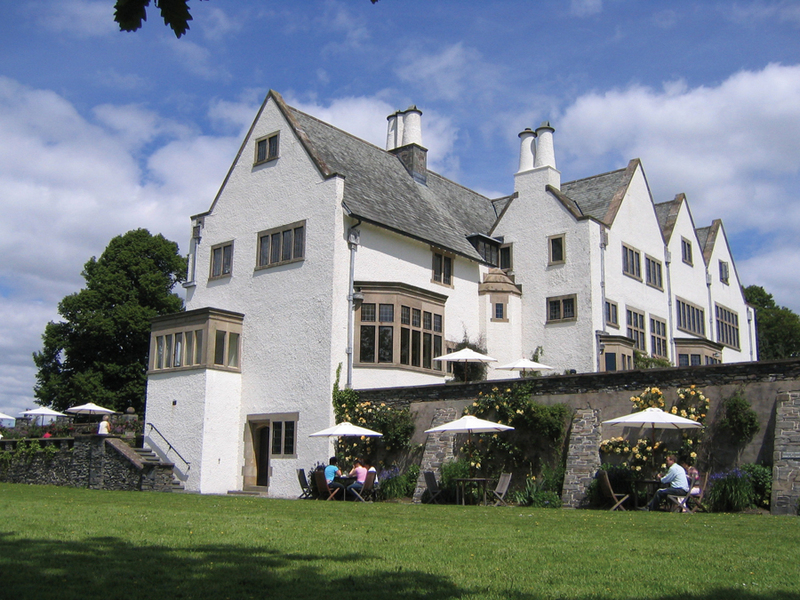 By 1999 Lakeland Arts had raised sufficient funds to purchase the house and by 2001 with building refurbishment finished, English Heritage raised Blackwell’s listing status to the highest level of protection, Grade I. His Royal Highness the Prince of Wales, who had supported the project from the beginning, officially opened the house in September 2001. It was a picture-perfect day when I visited Blackwell to talk to Grace Holland and Jo Clayton who now look after the gardens. (pictured above, Grace left, Jo right). Sadly, the original garden plans have not survived although you can see the broad layout from early photographs. Grace points out that she came to look after the garden through the previous head gardener, Gary Primrose. 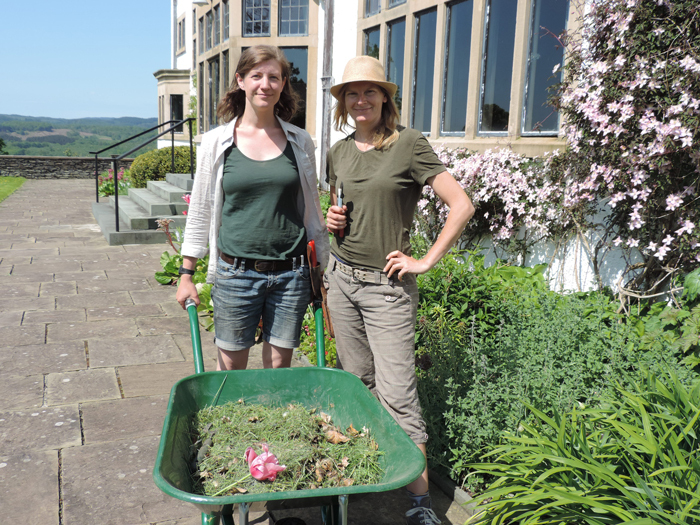 Both Grace and Jo have enjoyed the benefit of Gary’s mentoring and for Grace – who has the overall responsibility for ensuring that Blackwell’s gardens are kept in harmony with the house – his advice has been invaluable. Obviously, the house sits on an exposed site above the Lake so there are challenges: “The original planting scheme had plants which have had to be replaced over the years with hardier varieties to stand up to the weather,” Grace points out. “I want to try and pick up on the prairie style planting as we have a lot of water but a short season here.” The modern planting scheme includes clematis, tulips, crocus ‘Citronella’ dahlia ‘David Howard’ ‘Johnson’s Blue’ geranium and alliums, cornflowers and fragrant herbs including lavender. Rowan trees have also been planted as they provided the inspiration for much of the interior decoration. 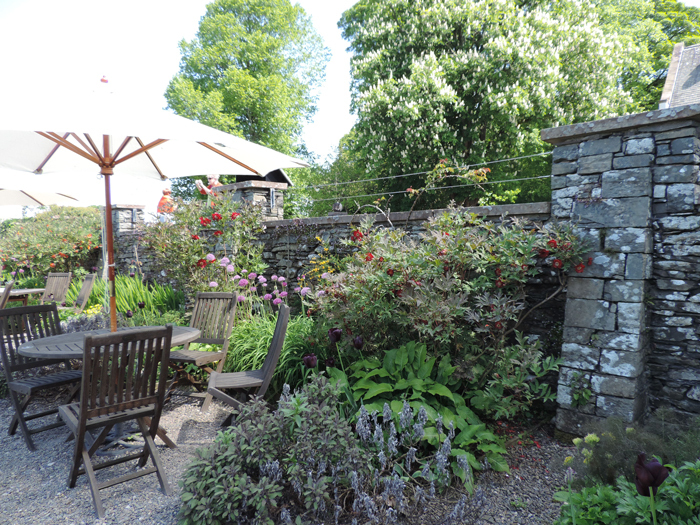 As the house was originally a holiday home the gardens were kept simple and easy to maintain but the key to this garden is that it gives the feeling that the whole of the Lake District is the garden, rather than a separated, defined area. That in itself is pretty special. Jo remembers that the lawns were particularly difficult when they first started at Blackwell both from the point of view of the winds and the different levels. Obviously working outside in Cumbria’s often challenging conditions has its own issues, but it was plain to see that as far as Grace and Jo were concerned it was a privilege and just part of the job. Coming to work in Blackwell’s garden is a joy for both Grace and Jo. 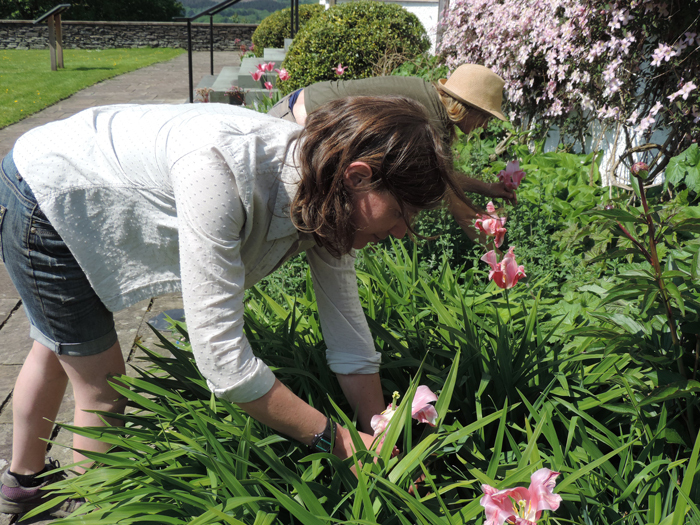 For Grace, who had been working as a gardener for six years before coming to Blackwell, it took her a long time to stop seeing gardening as bread and butter work that didn’t need a brain! “I quickly realised that the days I really looked forward to going to work were the days I was gardening,” she explained. “If I really explore why I enjoy it I suspect it’s a combination of having my hands in the soil and its creative element. There is an element of production about it.” For Jo, who comes from a woodland management background, it’s the outdoors that attracts and you can clearly see why both gardeners love the garden and want more people to experience its special atmosphere. Sit on Blackwell’s terrace with a nice morning coffee or afternoon tea and there is no finer place in the world. The views are breathtaking, the garden calming and peaceful. Blackwell has a striking and imposing presence in the landscape and by visiting the garden you really do feel part of that landscape. 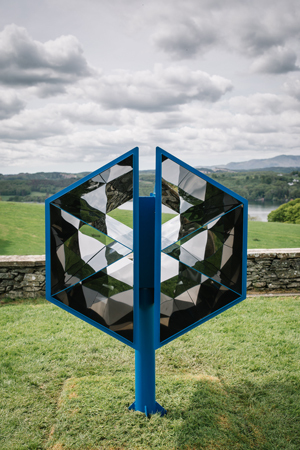 At the time of my visit I was able to enjoy a rather special view of the lake and surrounding hills through the prisms of Di Mainstone’s Time Mirror (pictured left) which is sitting on the lower lawn overlooking the lake. 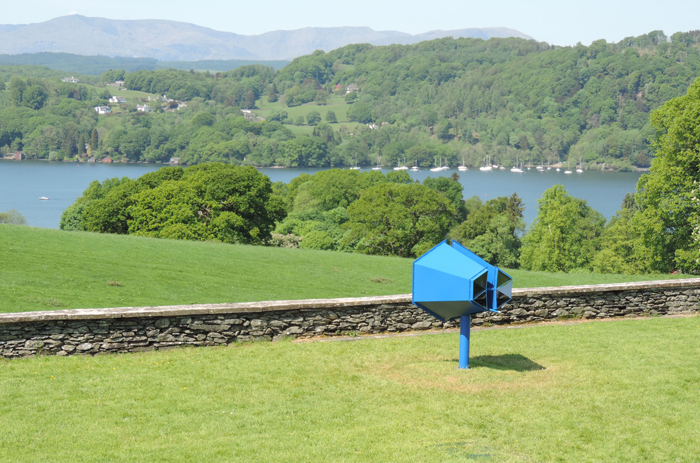 This interactive sculpture is part of Lakes Culture’s Lakes Ignite 2018 festival and enables visitors of all ages to experience and capture the cultural landscape in an experimental and abstract way. I loved it. The polished steel sculpture is painted in Blackwell Blue, inspired by the colour blue of the peacock frieze on the tiles inside the house and will remain in the garden until September 2018. In fact, Blackwell is the perfect arts venue and during 2018 will be hosting some of the biggest names in world sculpture including Grayson Perry (21st September to February 2019). On my visit I was able to view the Form over Function exhibition, bringing together an outstanding collection from the very best contemporary ceramic artists. Photo credits: All photographs are ©Reckless Gardener with the exception of the banner picture of Blackwell ©Lakeland Arts; Time Mirror ©Lakeland Arts; Dining Room stained glass window, top left: ©Lakeland Arts.